The Peninsula Mortgage Lenders Association (PMLA) is a trade association composed of mortgage lenders, brokers and affiliated industry associates. STAY UP TO DATE WITH OUR EVENT EMAILS AND ANNOUNCEMENTS! 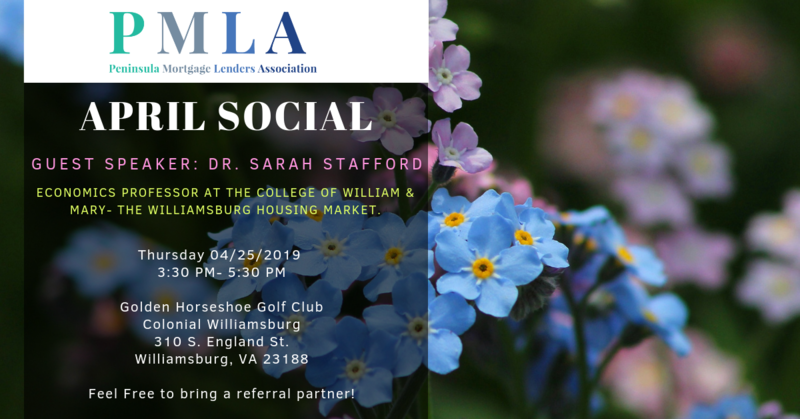 Join us for our 2019 April Social on Thursday April 25th, 2019 from 3:30pm to 5:30pm at the Golden Horseshoe Golf Club, Colonial Williamsburg. Our Guest Speaker is Dr. Sarah Stafford! Topic: Economics Professor at The College of William & Mary- The Williamsburg Housing Market. Feel Free to bring a referral partner! AFFILIATES: Click the link below to be redirected to our e Online Payment Membership page where you can choose the Membership level that best fits your needs.